SPRINGFIELD, Mo.– The Greater Ozarks Chapter of the Knights of Columbus helped out the community with Coats for Kids. Knights of Columbus held there second annual Coats for Kids drive on Sunday, November 18. 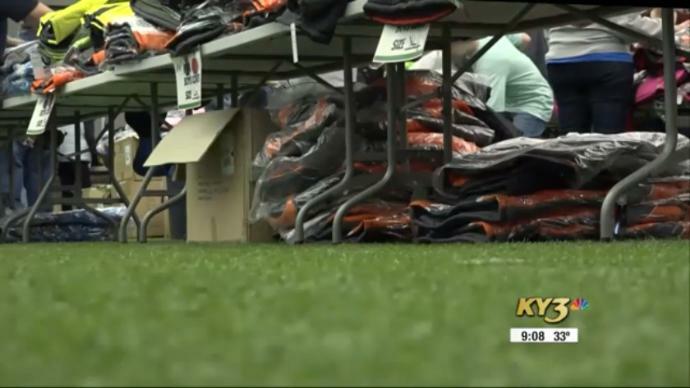 They gave away over 250 coats within the first 45 minutes,surpassing last years numbers. “One little boy said, ‘I’m not going to be cold,” said Frank Barchak, the President of the local Knights of Columbus Chapter. Which was the goal for the Knights of Columbus coats for kids coat drive. No questions asked, If you have a child, and they needed a coat, they got it. “No administration fee, 100 percent of the money goes straight to these kids,” Barchak said. Volunteers from all over came from near and far to help with the coat drive. “Probably got 50 volunteers and everyone of them said the same thing. Wow, this was worth it,” Barchak explained. Worth the endless preparation hours and time put in, all to see the look of relief on a parents face. “I had one lady say, I had no idea how I was going to put coats on my kids this winter,” Barchak said. Along with the smile and joy on a child’s face, after receiving their brand new coat. All the children were excited, happy for their new coats. “Thank you to them to think about all the people that might not have coats for winter,” said Lopez. Thanking Knights of Columbus for their new coat this winter. Which was fitted just for them, selected by them and worn out the door ready for winter.